A great flood is one of the most common elements in most mythologies. 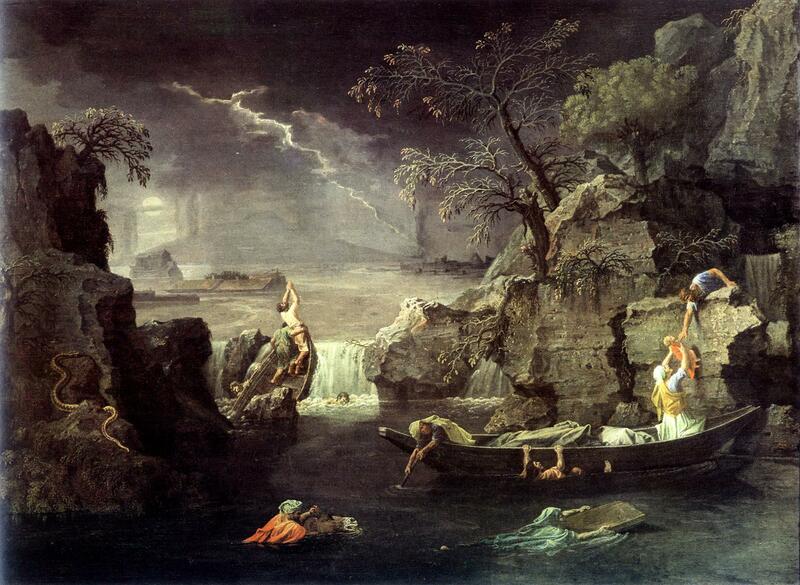 Floods appear in several variations across many quite different mythologies, and are a popular subject for depiction in European and non-European paintings. The best-known story, at least in Europe, is that given in the Old Testament, in Genesis Chapters 6-9: the people of the world had become wicked and turned their backs on God, so God decided to send a flood to wipe them off the face of the earth. Only the faithful Noah and his family were to be spared, in recognition of their more godly ways. Noah was therefore told to build a large vessel, the Ark, into which he placed himself, his family, and a breeding pair of all the animals and birds on the earth. The rain then fell and the earth flooded for a period of anything between 40 and 150 days. Everyone and everything else was engulfed in the waters and died. As the flood started to recede, Noah sent out a dove every seven days. One day the dove returned with an olive branch; a week later the dove did not return, and had presumably reached dry land, in the vicinity of Mount Ararat. The flood then subsided and the earth was repopulated by the survivors from the Ark, and God made a covenant that the earth would never be flooded again in this way, and the rainbow would serve as the marker of that covenant. There is a parallel account in classical Greek myth, told in Ovid’s Metamorphoses and elsewhere. Prometheus warned his son, Deucalion, who was the ruler of Phthia, that a flood was coming, and to build a chest to contain provisions. The flood came, and only Deucalion and his wife Pyrrha survived. The chest touched ground at Mount Parnassus (or Mounts Etna, Athos, or Othrys, depending on the version). As Deucalion and Pyrrha were old at the time, they consulted an oracle, who told them to cover their heads and throw rocks behind them. This they did and the rocks turned into people, who then repopulated the world. Among the other myths is a Hindu account of a great flood in the Puranas, where it is Manu, the first man, who avoids the flood. Sadly there are only limited images available to represent that, and none is really comparable with those of the European stories. Paintings depicting the Biblical or Greek great flood fall into two main categories: those showing the process of flooding and the deaths of the wicked, and those showing the flood at its height or falling. 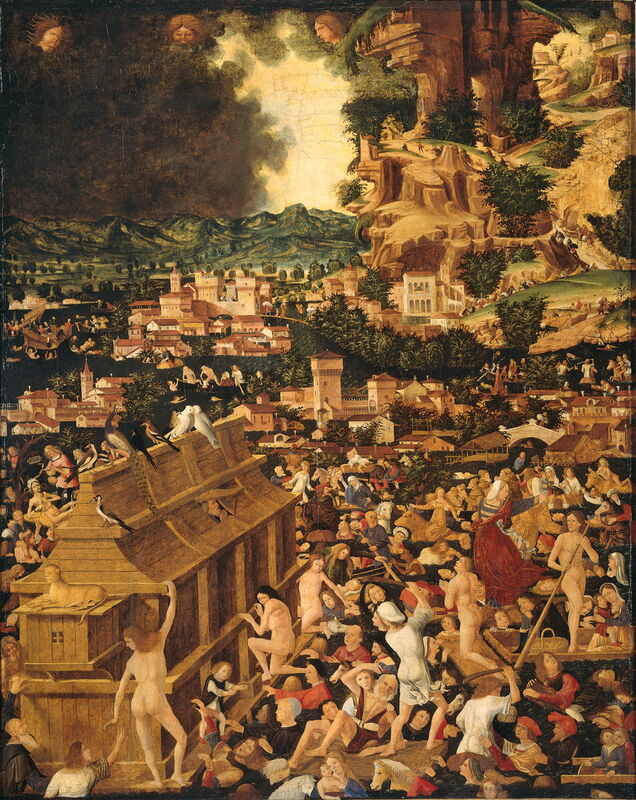 Unknown, The Great Flood (c 1450-1499), oil on panel, 122 × 98 cm, Rijksmuseum, Amsterdam. Wikimedia Commons. This painting by an unknown artist of The Great Flood (c 1450-1499) features Noah’s Ark, with its rich collection of wildlife, at the lower left. This is floating in the remains of a populous town, whose inhabitants fill the forming lake. Few facial expressions or body language bring out their distress, though, leaving a relatively bland overall impression. Michelangelo di Lodovico Buonarroti Simoni (1475–1564) The Great Flood (c 1509), fresco, 280 x 570 cm, Sistine Chapel, The Vatican. Wikimedia Commons. Michelangelo’s The Great Flood (c 1509) in the Sistine Chapel is quite different. Noah’s Ark is in the background, and rescuing survivors from the water. Those who make it to land are more obviously distressed, and one appears to have drowned already. Desperation and panic are setting in. Joachim Wtewael (1566–1638), The Great Flood (1595), oil on canvas, 148 x 184.6 cm, Germanisches Nationalmuseum, Nuremberg, Germany. Wikimedia Commons. 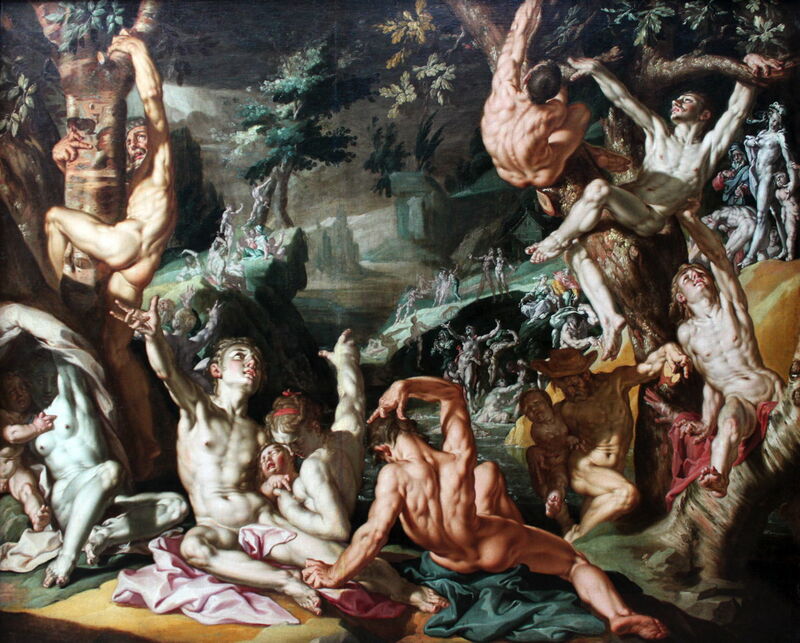 Joachim Wtewael’s The Great Flood (1595) has more atmosphere, although its naked bodies appear curiously contorted. Wtewael is enjoying something of a revival as the result of exhibitions last year, but here at least seems enigmatic. 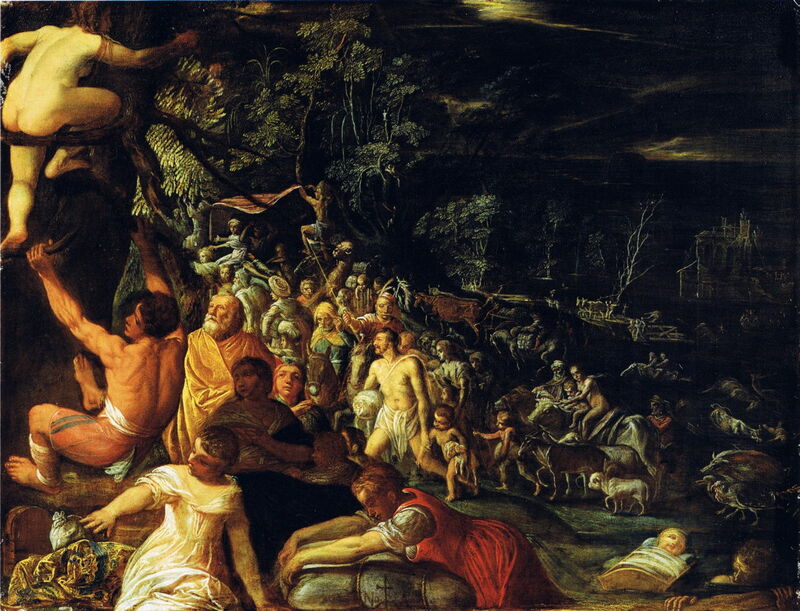 Adam Elsheimer (1578–1610), The Great Flood (c 1600), oil on copper, 26.5 × 34.8 cm, Städelsches Kunstinstitut und Städtische Galerie, Frankfurt am Main, Germany. Wikimedia Commons. Adam Elsheimer’s The Great Flood (c 1600) is more conventional. It is nighttime, and the dense clouds are lit only by flashes of lightning. The population of a village is processing up to higher ground to escape the rising floodwaters. Faces are anxious, but there is no terror or panic. Nicolas Poussin (1594–1665), Winter (Flood) (c 1660-1664), oil on canvas, 118 x 160 cm, Musée du Louvre, Paris. WikiArt. Poussin combined his depiction of the flood with one of his late seasons, Winter (c 1660-1664). Lightning flashes in the background, where Noah’s Ark is seen floating securely. A small crowd has taken to the roof of a building to escape the waters. More desperate struggles are shown in the foreground, with a boat almost capsized, its occupant raising his hands in prayer. More curious is the appearance of a snake, on the rocks at the left. Poussin not infrequently included snakes in his landscapes. This has not been explained convincingly, except as a reference to the role of the serpent in the Fall of Man, Adam and Eve in the garden of Eden. John Martin’s The Deluge (1834) is more thoroughly apocalyptic, and refers to a non-Biblical account of a great flood resulting from an adverse alignment of the sun, moon, and earth and coincident impact of a comet. 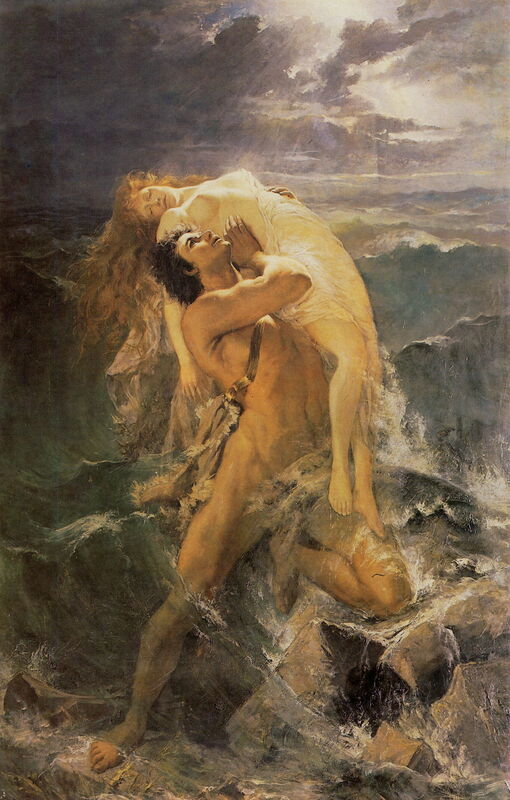 Unusually, Merwart’s The Flood, painted towards the end of the 1800s, refers primarily to the Greek myth of Deucalion, who is here holding his wife up from the crashing waves. Unfortunately he does not appear to refer to the chest which was key to their survival. 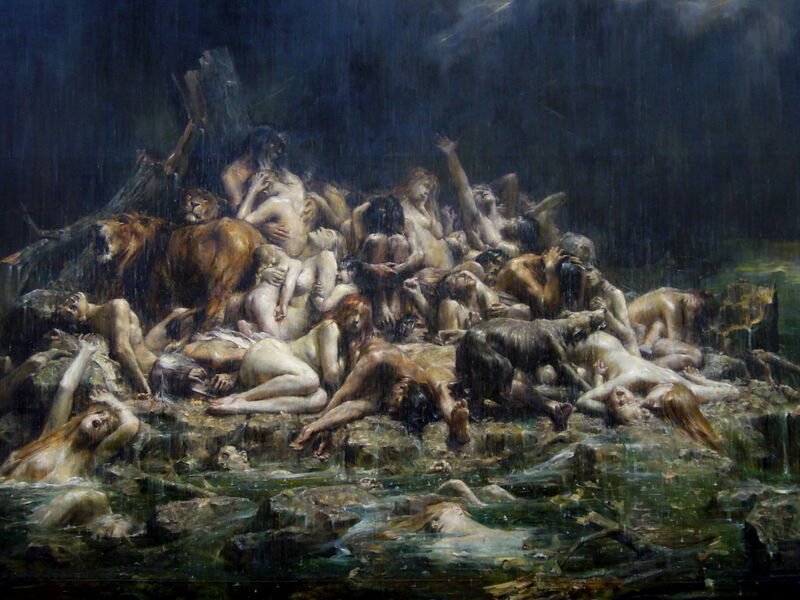 Comerre’s The Flood of Noah and his Companions (1911) seems to have an inappropriate title, but captures most dramatically the struggle of a packed mass of naked humans and animals, with others slipping into the waters below to drown. This is also one of the few paintings of the flood which successfully conveys the impression of rain and everything being sodden wet. This appears to refer to Géricault’s The Raft of the Medusa, most appropriately, too. 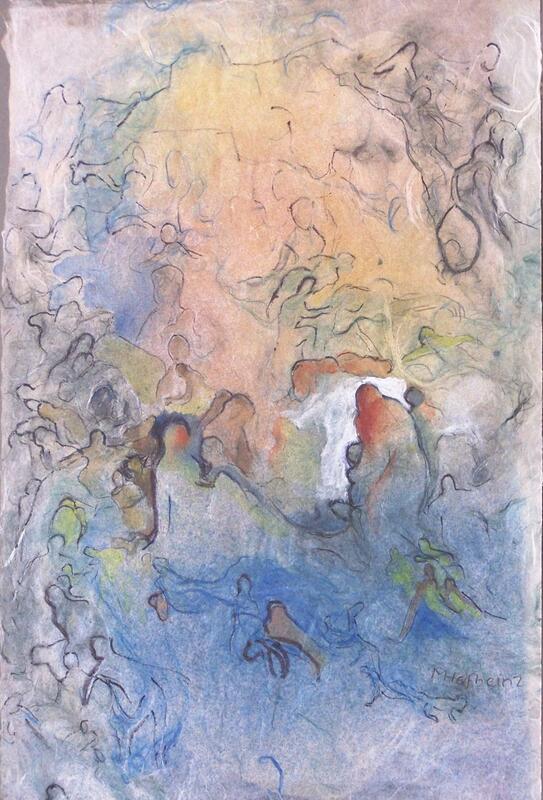 Margret Hofheinz-Döring’s The Flood (1962) shows many people in outline, and uses a watery blue, but avoids death and disaster altogether, appearing quite serene. 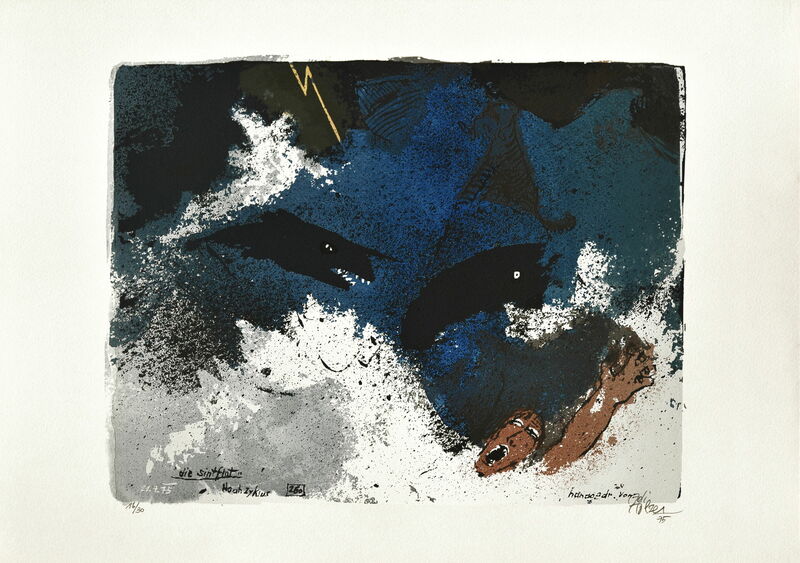 Adi Holzer (b 1936), The Flood (from the Noah Cycle) (1975), serigraphy print on paper, 41.7 x 29.5 cm, location not known. Courtesy of the artist, via Wikimedia Commons. Holzer’s The Flood (1975), from his Noah Cycle, includes a surprising amount of detail in its simplified content: a bolt of lightning, the Ark tossed around on the waves, splashes of white foam, a toothed shark, a whale, a tiger stranded on a rock. In the foreground, and clearest of all, is a single person, gasping for breath, their left hand held up in a bid for aid. 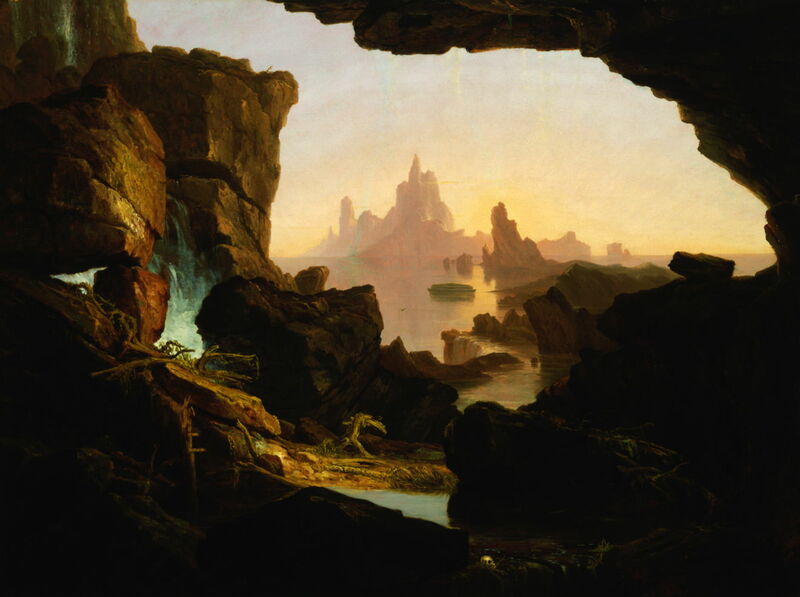 Thomas Cole (1801–1848), The Subsiding of the Waters of the Deluge (1829), oil on canvas, 90.8 × 121.3 cm, Smithsonian American Art Museum, Washington, DC. Courtesy of Smithsonian American Art Museum, Gift of Mrs. Katie Dean in memory of Minnibel S. and James Wallace Dean and museum purchase through the Smithsonian Institution Collections Acquisition Program, via Wikimedia Commons. Thomas Cole’s The Subsiding of the Waters of the Deluge (1829) shows a more serene view, of the Ark floating peacefully in the middle distance, as barren land returns from the falling waters. Remains of uprooted and smashed trees appear, as does a single white human skull at the bottom. Joseph Mallord William Turner (1775–1851), The Morning after the Deluge (c 1843), oil on canvas, 78.5 x 78.5 cm, The Tate Gallery, London. Wikimedia Commons. Turner’s painting of the flood itself is, I think, altogether too vague to support much in the way of narrative. However its companion The Morning after the Deluge – more correctly Light and Colour (Goethe’s Theory) – the Morning after the Deluge – Moses Writing the Book of Genesis – (c 1843) has more structured content. In a colour vortex based on Turner’s interpretation of Goethe’s Colour Theory, Moses is seen in the distance, writing the book of Genesis. In front of him is the brazen serpent used by Moses in the wilderness as a cure for plague, which symbolises Christ’s redemption of mankind in the New Covenant of his ministry on earth. 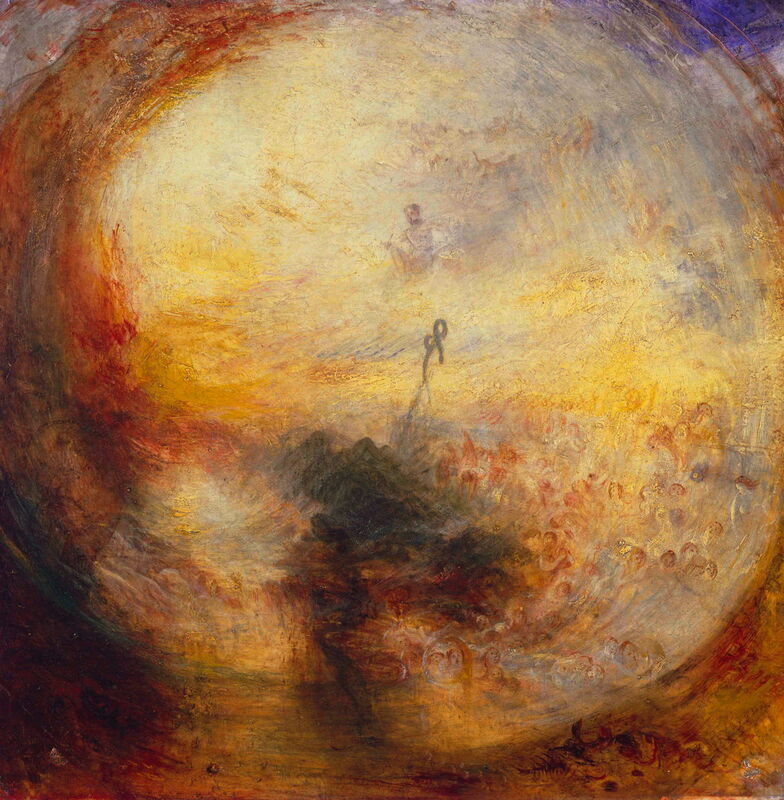 Although a visually spectacular painting, I do not think that Turner’s attempt to link colour theory with three completely asynchronous narratives results in a readable painting. Until the eighteenth century, most European artists (in common with the general population) believed the account in Genesis literally, and they would thus have thought that they were depicting a historical event, albeit with strong moral overtones. During the Age of Enlightenment, it gradually became clear that the earth’s and human history must have been different, and by the mid 1800s those who had a better education realised that the great flood was a myth. The 1800s also saw the birth of archaeology, and of many important excavations, particularly in the Middle East, where the Biblical story was centred. Although other sciences, notably geology, were dismissive of flood myths, the deciphering of the Flood tablet (tablet 11) and the Gilgamesh series around 1872 brought another account of a great flood from even deeper human history. Strangely, despite very extensive publicity, the Gilgamesh flood (and the Epic of Gilgamesh as a whole) has inspired almost no visual art over the 140 years since it first became widely accessible. 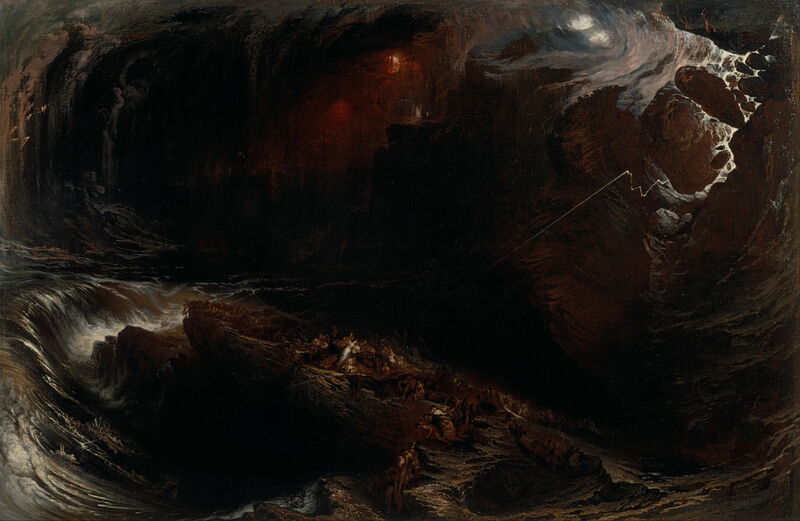 As shown above, modern depictions of the great flood – which remain popular in painting and other visual arts – appear firmly based on the account in Genesis, although Merwart opted for Greek myth, and Martin for a substitute theory. The Epic of Gilgamesh would have been known to many established narrative painters, including specialists such as Gérôme who had already visited the Middle East and painted many narratives from there. I think the main reason for those artists to reject the idea of painting Gilgamesh or his flood myth was the nearly complete lack of supporting visual material: almost all that we know from the Sumerians, Babylonians, and Akkadians has come to us in cuneiform texts, with few visual depictions to form a starting point for their visualisation. Even the most experienced narrative painter needs some visual clues to start with. Posted in General, Painting and tagged deluge, Deucalion, flood, Gilgamesh, narrative, Noah, painting. Bookmark the permalink. The human history being tought in schools today must be revisited as most of it is being debunked by modern discoveries.